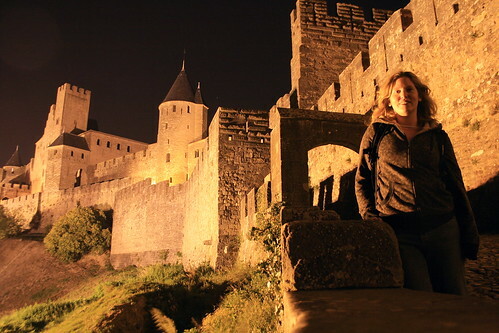 I wouldn’t normally fly several hundred miles just to go to an orienteering event – but then, an orienteering event in the Cité de Carcassonne in southern France was never going to to be just another orienteering event. Actually there were three events in the one weekend, a middle race on the Saturday afternoon, the Carcassonne sprint in the evening, and a long race on the Sunday morning, which made it an even better reason to travel down. Perhaps the biggest surprise of the weekend was that I enjoyed the other two events as much as the “headline” sprint in Carcassonne – indeed, I thought the middle race, held near Montlaur, around 20km away, was on some of the most amazing terrain I have ever run on in fourteen years of competing. 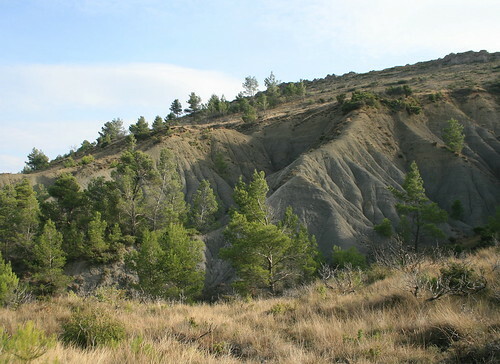 It is difficult to describe – imagine tinder-dry bare earth ridges and gullies – stable enough to run on, but often too steep to run off the edge of. The steepest edges, typically those steeper than 45 degrees, were marked with “impassable cliff” lines on the map. There were two pockets of this intense terrain separated by a run through some of the very many vineyards in the area. The bottoms of the gullies tended to be guarded by very prickly bushes, so staying high was the less painful, if more technical, option. I was pleased with my time of just over an hour for the 3.8km course – getting up any speed was difficult in the intensely technical and physical terrain. 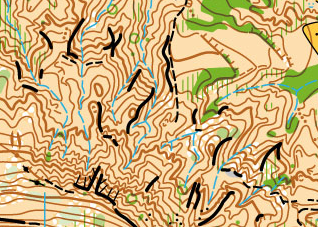 Orienteering doesn’t really get any technical – or enjoyable – than this. Multiple world-champion and local boy Thierry was also running my course – and finished in exactly half my time – amazing! I was impressed with the facilities that COORS (the organising club) had laid on for a relatively small-scale event – with commentary, traders and a bar. If only the French had heard of portaloos, it would be a perfectly organised event! The race itself was short and intense, with 17 controls and 190m of climb in the 2.7km course. The route led in and out of the city several times, including a steep climb up a grassbank, and running through the (dry!) moat to the finish line. 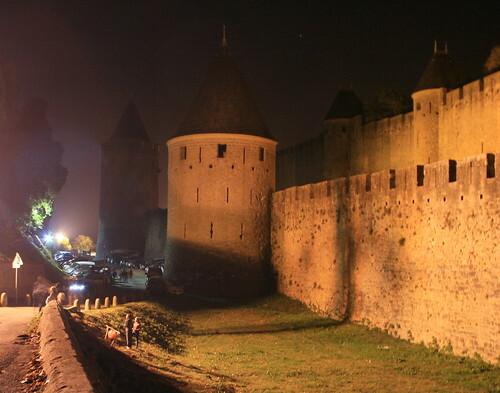 The walls are floodlit at night, but there were plenty of dark passages and alleyways where headtorches were needed. 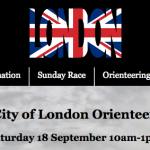 I finished 9 minutes down on Thierry, perhaps the only time I’ll be so close to the world’s top orienteer, although to be fair he did get around in 20 minutes. Finally, on Sunday, was the long race, back in Montlaur. The distance was less than 10km (with 400m of climb), but I was bracing myself for an epic, and so it proved to be. I made it back in 110 minutes, having spent 15 minutes on the wrong hillside about half-way around the course – one of those awful mistakes compounded by various features apparently fitting to the map. Although the landscape was largely open, it was full of vineyards, a blaze of yellows and reds, but tricky (and painful) to get around. There were some pockets of extreme complexity on the map, and also some epic legs – No. 2 to 3 was 2.2km across the valley and up a hill. Still, a rewarding challenge. Thierry again impressed by running at roughly double my speed. After the race was the prize ceremony – there were a few other Brits there and impressively, quite of them got prizes – it says a lot about the area that the winners got a bottle of wine and a bottle of pressed apple juice, and the runners up got the bottle of wine. Then it was time to head back to the airport and back home – but not before a combination of Google Maps missing a major bypass, and the reluctance of the French to sign destinations via their motorway network, on their signs, meant we took an unexpected detour through various villages on our way to Toulouse. A top quality orienteering weekend. I am new (and late) to orienteering, but very much enjoying it. If I get better I would hope to take part in events further from home. I just wondered, how do you find out about interesting events like this? !